An hour north of Nashville, nestled on a lush 15 acres along the Red River in Adams, TN, BobFest is a two day music, camping and arts festival. 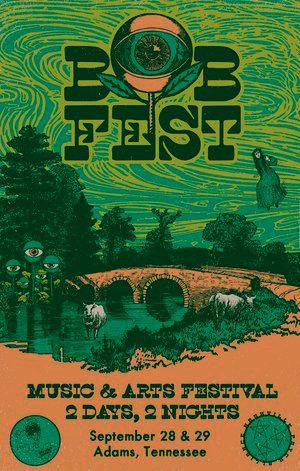 Hosted by Cold Lunch Recordings and Nashville Psych Alliance, BobFest includes two stages stacked with some of the region's best bands along with visual projections, local artists, beer and food vendors, libations, community campgrounds, morning yoga classes, swimming and other outdoor activities. Come escape with us on September 28 & 29. Tickets available now! All tickets are valid for both Friday and Saturday. Come for just one day if you want or camp out and stay for the entire weekend! Over 30 of the region's best bands on two stages for two days and nights. Okey Dokey, Ian Ferguson, Desert Noises, Chrome Pony and more! Click to learn more about BobFest. BobFest isn't just music! Visual Artists, Food & Beer Vendors, Yoga, Swimming & Camping are all part of the experience! Interested in helping out with BobFest this year?